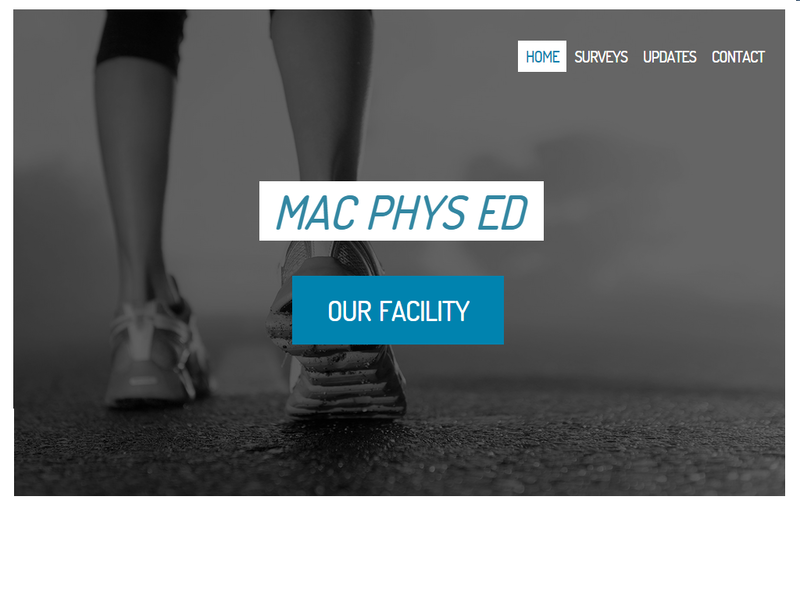 Description: The goal of our assignment was to create a simple, easy to use, easy to update website that the phys ed department can use to keep their students up to date with everything happening in the Mackenzie phys ed world. We started off by gathering as much information from Ms. Park and Ms. Aquino as possible. What they wanted was a simple site which was easy to navigate and update. Because Ms. Park and Ms. Aquino wanted a simple and easy site we chose to use Weebly because it is very straight forward, therefore they won't have any trouble updating the site for the rest of the year. Ms. Park wanted to include pictures of Mac's gym facility so new students or parents are able to see what we have to offer. To do this we created a button link which when clicked brings you to a gallery of photos of Mac's facility. One of the key features they wanted from the website was a survey. They wanted it linked to the site and wanted to be able to identify if it was a male or female answering the questions. To do this, we used Google Forms which allowed us to create multiple choice and short answer questions for the students to respond too after identifying their gender and grade. We created a survey page which include another button link which when clicked, directs the students to take the survey. Something that was also important to Ms. Park was to incorporate an updates page which includes the open gym schedule so its available to anyone at any time. Lastly, we added a contacts page which includes the phone numbers to both the girls and boys gym offices. We also included a link a to the official Mackenzie website which when clicked directs the students to a page where they can click the sport they want to learn about and watch an educational video on it. Upon completion of the assignment we showed Ms. Park the website to see if we had met all her expectations. We taught her how to navigate the site, how to update it and how to receive the responses and edit her survey. She was happy with her site and glad it was going to be easy for her and Ms, Aquino to keep updated. Application in Other Classes: A Weebly website is extremely versatile and useful for any course. When a teacher has a website, students have an easier time accessing their work, staying organized, and keeping themselves regularly updated on current events in the class. Many teachers use websites as a helpful teaching strategy that benefits both themselves and the students. Websites give students no excuse for being lazy. They make it extremely easy to access the classroom from home. They allow students to gain a new level of understanding and organization that would otherwise be difficult to attain. In particular, Weebly is a great platform for a website because it is so simple and allows for teachers to be creative and create a user friendly site that everyone in the classroom will enjoy.